A paper by Yuki Terayama researcher was published in “International Journal of Hydrogen Energy”. 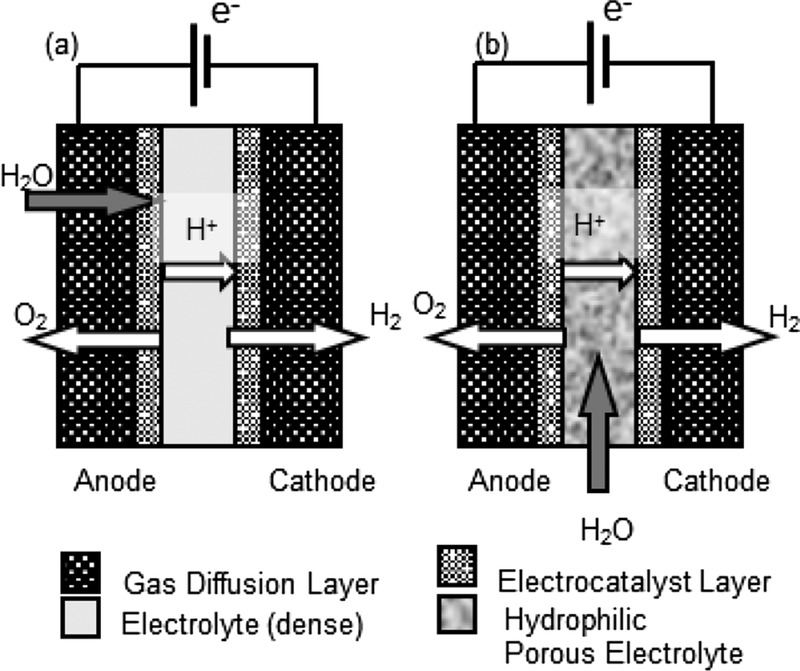 The characteristics of a water-absorbing porous electrolyte electrolysis cell, in which pressurized water is injected directly into the electrolyte layer, are investigated. High water support force is required for the gas diffusion layer (GDL) in this novel cell design, and therefore here we report a new type of hydrophobic GDL comprising an acetylene black (AB) and poly(tetrafluoroethylene) (PTFE) composite film. The method of preparation of the AB/PTFE slurry, film formation methods, and the AB/PTFE weight ratio were investigated and optimized. The ball-milling and transfer method were suitable for preparing uniform AB/PTFE slurry and successfully covering AB/PTFE film without any cracks on micro-porous layer coated carbon paper, respectively. An investigation about different PTFE weight ratios against AB from 0.1 to 6 showed a serious trade-off character between electrical resistance R, gas permeability V′, and water support force Plim. The 1/2.5 of AB/PTFE weight ratio was most optimal, which showed to have most equivalent R (2.5 Ω cm−2), V′(136 mL atm−1 cm−2 min−1), and Plim (0.25 MPa). We also confirmed that fabricated GDL with optimal condition was worked as the blocking layer against water injected through electrolyte layer and pressurized by nitrogen gas, and as gas-permeation layer for generated hydrogen gas in water electrolysis test. ← A paper by Young Sung Lee researcher was published in “Material Transactions”.